Salisbury Advertiser March 24, 1883: "On the 16th inst., at his residence near Delmar, Benjamin Elliott died of pneumonia in his sixty fifth year. The remains were buried Sunday, the services being conducted by Rev. G. W. Wilcox who preached from I. Cor. XIII 12. A concourse of friends and from Salisbury, Laurel, Delaware and other towns as well as the immediate neighborhood was present....He was a warm hearted honorable, unselfish gentleman. A widow, his second wife survives him and several children, all the offspring of his first marriage. His first wife was a sister of Elijah Gordy, Esq., and his second a sister of Mrs. S. Q. White, of this place." Salisbury Advertiser March 31, 1883: "The report of the Advertiser was in error Saturday as to the age of Benjamin Elliott. He was seventy five instead of sixty five years old." Salisbury Advertiser April 14, 1883: "The sale of the personal property of the late Benjamin Elliott, Wednesday, was largely attended. Prices ruled very good. Several young hogs brought 12 1/2 cents a pound and one sow and eight small pigs ran up to $26.50." This compiler's genealogical adventure on Dec 26 1997: It was a very nice day for late December on the Eastern Shore of Maryland with a high temperature approaching 60 degrees. Most folks were jammed into the stores and malls doing after Christmas shopping. However, I was in a genealogy sleuthing mood. My interests had been piqued the previous day, on Christmas, when talking to each of my Grandmothers they had given me some clues to check out in relation to our family history. My grandmother Hitch (nee Hamilton) had told me of an old family cemetery on a farm about a mile away on Meadow Bridge Road. She had heard of it from a Mrs. Stevenson who now owned the farm and, knowing that I frequent cemeteries (an affliction common among us genealogists), she arranged for me to go and visit it. I trekked out there up a long lane about 0.35 miles back in the field to a small cemetery. It had three headstones of the McGrath family who were not direct ancestors of mine. However, I diligently copied down the information to add to the cemetery records Shari Handley has been collecting on the Internet. Another lead I had gotten the day before concerned an Elliott ancestor of mine on my maternal side. His name was Benjamin Elliott whom I had been able to piece together limited information from Census records and an old obituary in the Salisbury Advertiser. 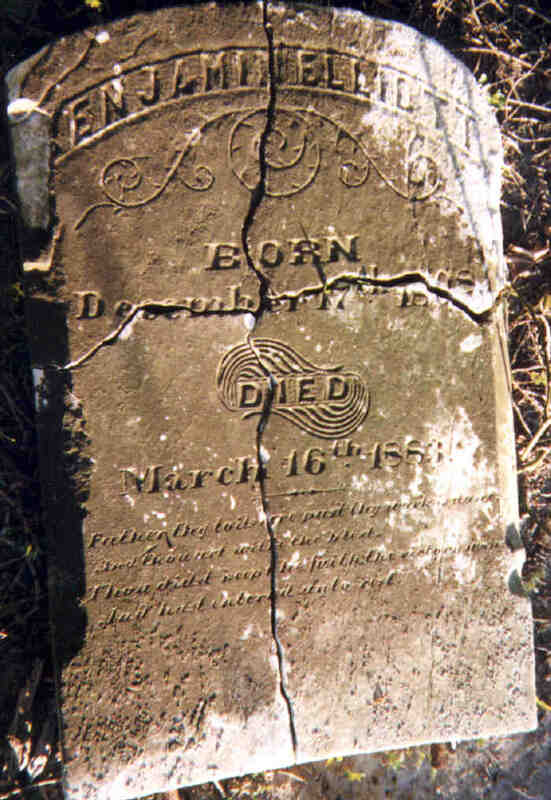 From these I had figured his birthdate to have been sometime in 1808 and his death as March 16, 1883. I had no clue as to where he was laid to rest. I had a conversation with my grandmother Wiltbank (nee Elliott) about her paternal line and she gave me some good information about where the Elliotts had lived just east of Delmar, MD/DE. I also consulted my 1876 maps of the Eastern Shore of Maryland and found the residence of a B. Elliott on the east side of Delmar sitting back from the old road that used to be used by the stage coach. The residence was situated very close to the Delaware state line. Using this record, I extrapolated where the location might be on a modern map and set out looking for it. I headed up the old road now called Stage Road that parallels U.S. Route 13 about 1/4 mile to the east. I found an old Nichols Family cemetery not far south of the Delaware line and conjectured that my Ben Elliott might be there. He was not, but again I jotted down the cemetery records for inclusion on the Internet. I then ventured further up Stage Road until I hit Line Road that actually is the MD/DE line for quite a few miles east of Delmar heading towards the ocean. I headed east on Line Road looking off to the south hoping to see an old farmhouse or something that may have been Ben Elliott's residence back in 1876. There were no houses - just a wide-open field. However, back in one of the fields just a little east of where Stage Road came into Line Road, there was a tell-tale clump of brush sitting back about 200 yards from the road. I slowed down to look for an access road that might lead me back to that brush pile. All I could find was a temporary and very muddy dirt land that had been used by the tractors and other farm equipment that had harvested the crops earlier in the fall. Putting my Explorer into four-wheel drive, I headed across the field. When I reached the brush pile (which is exactly what it was) all I saw initially was some overgrowth of small trees and a thicket of briars. It also looked as if the farmers had used the area to pile up old dirt and debris from the farm. Basically, it was a mess! I stopped and got out with my trusty Boston Terrier, Yaz to do some exploring. Anyone who has been to the Eastern Shore knows of what we locals call "bull briars". They are a thicket of green vines loaded with long and very sharp thorns. This place was overgrown with them! My great-great-great-great grandfather Elliott had been found! I was delighted to have finally found his resting place after more than seven years of searching! I had also determined his exact birthdate and his middle initial which I had not known previously. For me, this was the mother lode that us genealogists are continually seeking. The unfortunate thing was the condition of the cemetery. To say it was a mess is understating its horrible condition. Furthermore, the back part of the lot had been piled up with dirt probably covering up other graves in the cemetery. Also, the tombstones had evidently been toppled and broken by careless use of farm equipment in the area. To borrow another Eastern Shore-ism from my grandmother, it's a "cryin' shame" that the old cemetery had been allowed to deteriorate so over the years. I'm glad I found it when I did for I do not expect it to be there in a few years. I expect it to go the way of many of these old farm family cemeteries and either plowed under a field or bull-dozed to make room for a new housing development. This seems to be an unfortunate consequence of modern-day progress. It should also serve as a wake-up call to historians and genealogists everywhere to get out there and record these historical landmarks before they do indeed disappear. 2 Sussex Co., DE Marriage Records. 3 1850 DE Census, Listed as age 42 in the 1850 11th subdivisoon Sussex Co., DE Census (pg 265b). 5 1860 MD Census, Listed as Benjamin Elliott, age 50, in Parsons District, Worcester Co., MD, born in MD (pg 762). 6 1870 MD Census, Listed as Benj. Elliott, age 62, in Parsons, Wicomico Co., MD. 7 1880 MD Census, Listed as Benjamin Elliott, age 72, in Parsons District, Wicomico Co., MD, born in DE. 8 Salisbury Advertiser - March 24, 1883. 9 1850 DE Census, Listed as age 40 in the 1850 11th subdivisoon Sussex Co., DE Census (pg 265b). 10 1860 MD Census, Listed as age 47 in the 1860 Parsons, Worcester Co., MD Census. 11 1870 MD Census, Listed as Pollie Elliott, age 60, in Parsons, Wicomico Co., MD. 12 1880 MD Census, Listed as Sally Elliott, age 45, in Parsons District, Wicomico Co., MD, born in DE. 13 1870 DE Census, Listed as age 46 in Broad Creek, Sussex Co.